Lamy teamed up with LINE of South Korea to release a range of limited edition pens (fountain pen and rollerball set) commemorating some of the characters from LINE. LINE is a messaging App craze currently sweeping Asia. They are a range of characters you can use as emoji in your messaging. The characters also appear in various themed cartoons, and they have even recently released a full length feature film. You can find some of the cartoons on You Tube. The one I came across is LINE TOWN, in which the main characters of Brown (Bear), Cony (Rabbit), Sally (Duck), James (Man), Moon (Moon-headed Man) and the Boss appear. It is actually a very funny portrait of office life… in any country! 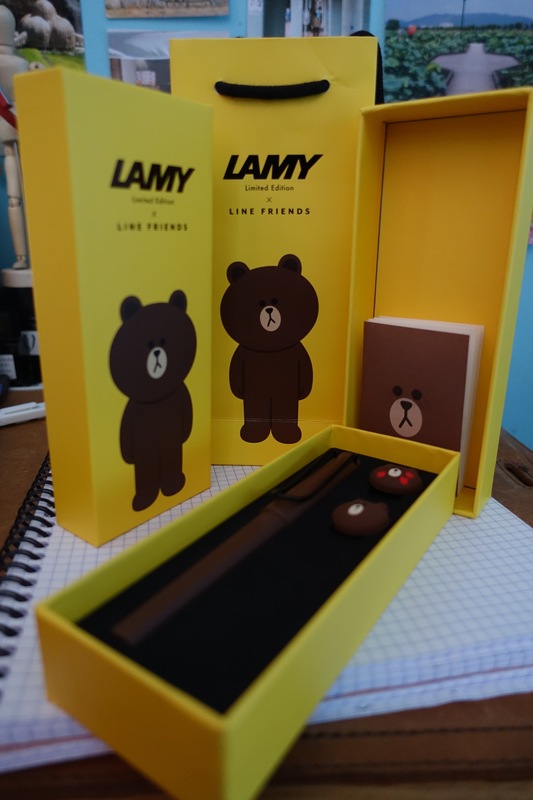 For this Lamy tie- up, the Fountain Pen and rollerball sets focussed on the three characters of Brown, Sally and Cony. These pens were a limited run for Lamy and are no longer being produced). I bought the Brown fountain pen and roller ball, pictured below. The “Brown” Fountain pen has proved to be the most sought after of the three characters for Lamay Safari collectors. Both because no Lamy Safari has ever been produced in this particular shade of brown, AND the cap and barrel material has a matt texture to it. Again NEVER seen before. 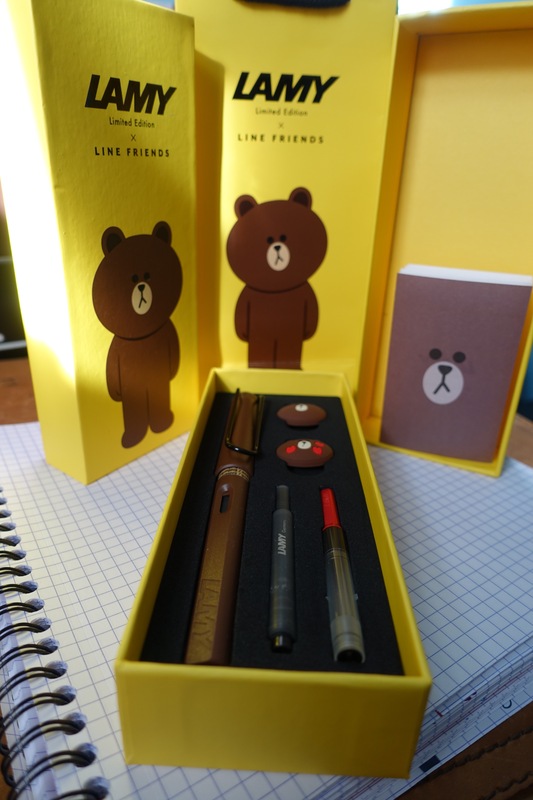 I have read that some of these collectors are very keen to get the “Brown” Fountain pen ONLY for the unique colour and texture…and not for the Bear’s faces at all. I wonder…. Here is the presentation of the Fountain pen and rollerball sets. Each comes packaged in a nice bright yellow Lamy box with 2 Brown faces in each. The fountain pen also comes with a Lamy converter and a Lamy cartridge. 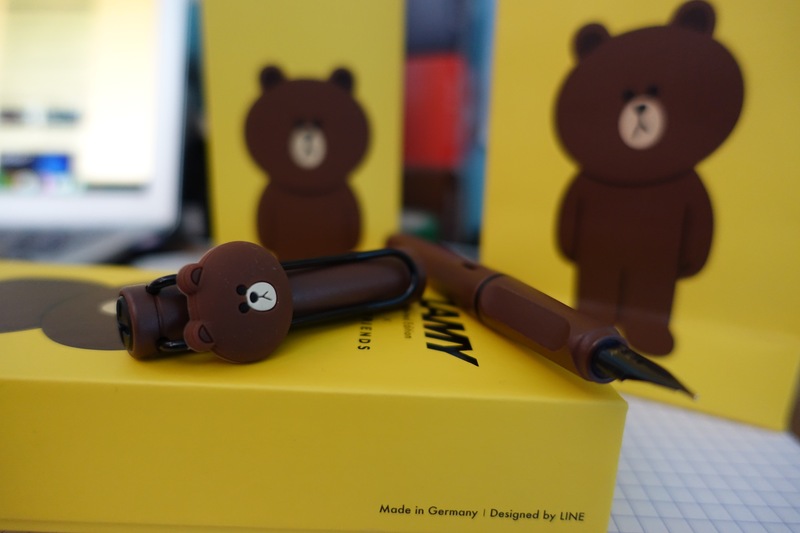 You are meant to accessories the clip with the bears face…?! Although these limited edition pens were not cheap, and I am not a Lamy Safari collector ( I prefer Omas and Nakaya! 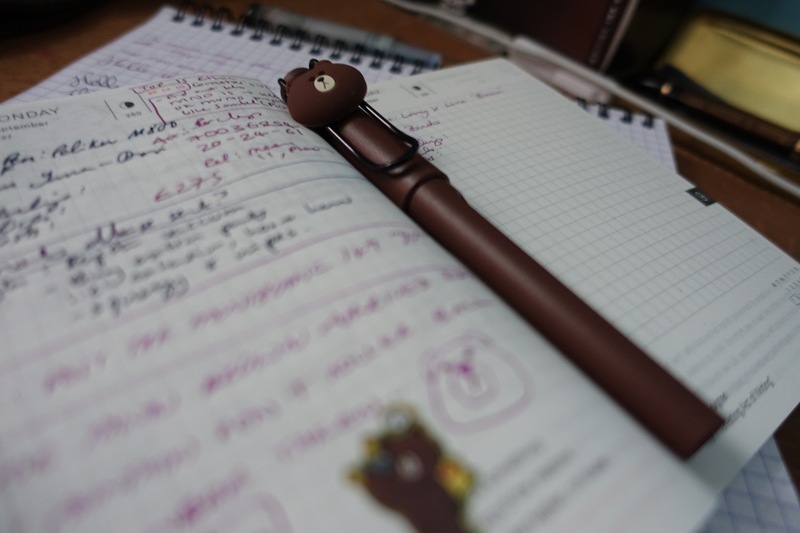 ), I am still weighing up whether or not to add the Sally set to my collection…at least the fountain pen version. To continue the theme I splurged on a whole load of LINE accessories- imported from K-poptown of South Korea. Imports tax and all! Please visit the Accessories page for more info.